Although it’s been months since my last post, I find myself still in book 2 of the Amours! This is really the very last poem from book 2 I’ll be posting, though: the lengthy Elegy which Ronsard prefixed to the book as he sent it out into the world. Salir ny fueilleter aux mains du populaire. « Sans espoir de retour s’eschappe la parole. Plus subtils par le nez que le Rhinoceront. Voy du port la tempeste, et demeure au rivage. « Tard est le repentir de tost s’estre embarqué. D’yeux, et de hausse-becs, et d’un branler de teste. « Sage est celuy qui croit à qui bien l’amoneste. Et je ne t’aime moins qu’un pere aime son fils. Retenir au logis, plus tu hausses la bride. De moy le pere tien, l’honneur et l’innocence. Si long temps amoureux sans leur lien desfaire. « N’est homme, mais d’un Tygre il a prins sa naissance. Viendra sans y penser, qui la rendra meilleure. De vouloir adoucir une si sotte beste. M’estime qui voudra, je le conseille ainsi. Que le fidele amy à bon droit cuidoit sien. N’a pitié des captifs aux environs esclaves. Il faut prendre querelle, il faut les suporter. Que me voir serviteur d’une Dame rusée. « Et d’autant qu’elle est femme, et d’autant qu’elle sçait. Il fut premier autheur d’une grande misere. Durant le temps qu’il vit, d’un si fier animal. Qui scintilloient encor les amours de Pâris. Le fils chercher le père en Sparte la cité. « L’homme, de qui l’esprit toute beste surmonte. Comme un rare joyau qu’on treuve peu souvent. « Qu’elle se donne à nous, et de cœur et de cors. Les torrens, les rochers, fascheux à traverser ? Traite fidellement de son amy le cueur ? Ce jeune enfant ailé qui des amours a soin. « Car un homme est bien sot d’aimer si on ne l’aime. L’ingenieux Ovide, et le docte Catulle. Coulant d’un petit bruit, comme une eau qui distile. A la simple Venus, et à son fils Amour. Combien peuvent les nerfs de mon petit sçavoir. (Pour avoir part au bouc) la tragique tançon. Humble je veux user d’une Muse plus douce. Le touche de la main dont elle tient ma vie. Ce labeur que je voüe à ses pieds consacré. Dirtied or leafed thorough by the crowd’s hands. Sharper noses than the rhinoceros. See the storm from port, and stay on the shore. With their eyes, their lifted noses, and a shake of the head. And I love you no less than a father loves his son. To keep you at home, the more you pull at the bit. Your father’s – my own! – honour and innocence. Love so long a time without breaking our ties. And his Muse in the lap of an old mistress. Indeed a great fool to love but not have her at all. Will come, unexpectedly, which will make her better. Trying to soften so foolish a beast. Or praise me who will, I counsel him thus. Which the faithful lover rightly thought his own. Has pity on the captives in his slave-quarters. He must take up her quarrels, and endure them. Than to become the servant of a sly Lady. He was the prime author of great misery. During their lives of so proud a beast. Which sparkled still with love for Paris. The son to seek his father in the city of Sparta. As a rare jewel most infrequently found. Over torrents and rocks, tiresome to cross? Treats her lover’s heart faithfully? That young winged child who watches over love-affairs. Where Love now keeps me under his yoke. The ingenious Ovid and the learned Catullus. Flowing with a gentle sound like a tinkling spring. To simple Venus and her son Love. How loud the strings of my little learning can sound. And serious tones (assuming the tragic buskin). In lower style I prefer to employ a sweeter Muse. Touches it with the hand in which she holds my life. This work which I dedicate, consecrated, at her feet. A few words of commentary on these 200 lines:- the rhinoceros (or, in the earlier version, elephant) has a ‘subtle’ nose, one good for smelling out the good and the bad: ‘sharp’, we could more easily say in English, but while it’s obvious which sort of ‘sharpness’ the elephant’s nose has, it’s perhaps less so for the rhinoceros where a ‘sharp’ nose could refer to its horn not its sensitivity.- Ronsard’s cynicism about Petrarch’s chaste relationship with Laura is perhaps also a corrective to those scholars who think Ronsard’s own affairs were more imagined than real? His harsh words about women, implicitly applied to Cassandra, should not be taken too literally: he speaks elsewhere of still loving her. – where Ronsard turns to his new love in Anjou, he says “Je desliay du tout mon amitié premiere, / Pour en aimer une autre en ce païs d’Anjou“; that “en” technically means that he is giving Marie his first love, transferring it from Cassandre: this is not a new love, but the old one with a new subject. – for the really interested, “empoulément” is ampoulément, from the same root as ampoule, a ‘swollen’ bulb of glass. See the next post for Blanchemain’s earlier version with its many variants. Me conduisoit du Fare de ses yeux. Leads me with the beacon of her eyes. Here is Ronsard writing a sonnet to his friend Joachim du Bellay, in response to one du Bellay had written him in his “Olive” (the first book of French love sonnets and inspiration for Ronsard’s own “Amours”). But, as will appear, it is not a direct response, for it is a carefully-constructed love poem about Cassandre while addressed to du Bellay. Bellay’s, by contrast, is in praise of Ronsard himself. Should we read too much into that? I don’t think so: there’s no intended slight on du Bellay simply because Ronsard doesn’t tell him he too is marvellous! After all, both call the other ‘divine’. Des doctes sœurs les sagettes divines. Trop pesant faix pour mes foibles espaules. The newest strains of your songs. The divine arrows of the learned Sisters. Too weighty a deed for my feeble shoulders. Wonderful as this poem is, it’s immediately obvious that it’s in a far more ‘learned’ style, replete with classical allusions: we know Ronsard can do this too if he wants to, so it is worth noticing that he didn’t. That is, perhaps, what sets Ronsard apart in his earliest poetry – the cultivation of a more natural style, a new way of writing French poetry which retains the art but broadens the range of subjects, of themes and of language. So, Theban archer? Well, Ulysses famously had a bow that could not be bent by anyone else (end of the Odyssey); but he’s not Theban. Philoctetes (in Sophocles’ play) has to be lured back to the Trojan War because only he can use the essential bow; but he’s not Theban either. Diana/Artemis joins with her brother Apollo in killing Niobe’s children – Niobe was Theban, but not the gods. I think the likeliest candidate is Hercules – who is also not Theban. Philoctetes is keeper of the bow of Hercules, which only he can draw; and Hercules married Megara, the daughter of the Theban king, before killing their children in a divinely-induce rage and thus having to undertake the twelve Labours. The children (and, some say, Megara) were venerated at, and said to be buried in, a ‘heroon’ (hero’s tomb) at Thebes in classical times. The how about the ‘divine arrows of the learned sisters’? Well, Apollo and Artemis certainly have divine arrows – see Niobe’s fate above – but they are not ‘learned sisters’. Equally, the Muses are learned but not in the arts of war. Other groups of siblings might include the Graiai and Moirai (Fates) but they don’t use arrows. And of course the arrows in du Bellay’ metaphor are the arrows of art & poetry. So, my own hunch – no more than that – is that du Bellay is conflating the Muses and Apollo, for Apollo was ‘mousagetes’, the leader of the Muses: Apollo brings the bow, the ‘arrows’ are the attainments of the Muses. His vocabulary is also deliberately demanding of the reader: in line 2 the target “Memoire” is clearly Remembrance or being remembered, the target of gaining a Memorial, rather than simple Memory. And in what way does du Bellay want Ronsard to sing his ‘newest modes’ on the Loire – is that new poetic forms (ode, elegy, hymn); or the stylistic innovations mentioned above; or simply ‘come and write your new poems here on the Loire’? Le conduisoit du Fare de ses yeux. Leads him with the beacon of her eyes. Notably (to me at least) the early version of the ending is consistently third-person – Ronsard is ‘he’. In the later version at the top of the page, he is third-person in the first tercet but switches awkwardly to first-person in the second tercet. That could have been easily remedied: “Croizant en vain les mains devers les Cieux” would have done the trick. It is interesting to see that Ronsard puts the poetic effect of the repeated ‘s’ and ‘z’ sounds – and the visual effect of the other ‘s’s in the line – ahead of a strictly consistent pictorial or grammatical approach. Craignant que mon salut n’eust ton œil offensé. Growing in beauty one beside the other. Did not consider me worthy of a single look. Like a lady who does not wish to be desired or loved. Terrified that my greeting had offended your glance. Blanchemain’s text is identical. He adds a footnote from Nicolas Richelet’s commentary: “Binet, close friend of the poet, says that this was originally addressed to the countess of Mansfield, eldest daughter of the mareschal de Brissac, and subsequently accommodated here”. 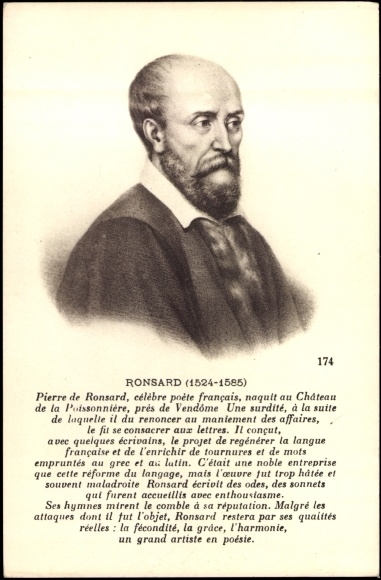 Claude Binet was a lawyer and friend of Ronsard in his last years, and famously wrote the first biography of the poet, his ‘Life of Ronsard’. And so we come to the end of the 2nd book; with a double-helping of epitaphs, as this is a poem Ronsard re-wrote quite considerably (though in fact the changes in the fist 5 lines are simply a switch from ‘you’ to ‘she’). Qui fut toute mon Tout mon bien et mon envie. Et ensemble mon cœur mes pensers et ma vie. La terre te regrette, O beauté sans seconde ! Maintenant tu es vive, et je suis mort d’ennuy. Malheureux qui se fie en l’attente d’autruy ! Trois amis m’ont deceu, toy, l’Amour, et le monde. Who was all my All, my good and my desire. And together with them my heart, my thoughts, my life. The earth misses you, o peerless beauty! Now you live, and I am dead from anguish. Unhappy he who trusts in the desire of another! Three friends have deceived me: you, Love, and the world. Blanchemain’s version with its many variants follows: though less polished, this version reads better to me. Qui fus toute mon cœur, mon bien et mon envie. Tels qu’ils eussent d’un mort ressuscité la vie. Qui s’abuse d’Amour et qui se fie au monde ! You who were all my heart, my good and my desire. Which could almost have brought the dead back to life. Who is mistaken in love and who trusts in the world! SUR LA MORT DE MARIE. Que l’amoureuse vie est un plaisant cercueil. La jeune peau d’Atys dessur le mont Idé. Et moy d’une beauté qui ne sort que d’enfance. That the lover’s life is an absurd coffin. The young skin of Atys upon mount Ida. And I with a beauty who is just leaving childhood. Est heureuse d’avoir le bien d’un si beau deuil. La jeune peau d’Atys sur la montagne Idée. Is fortunate to have the benefit of so fair a grief. The young skin of Atys on the mountain of Ida. Et te plaisant de luy desplaire. Le voudroit bien avoir de moy. Il n’a de toy bon traitement. Qui m’est plus douce, et non si belle. And please yourself by displeasing it. Would surely like to have it from me. It does not have better treatment from you. Who is kinder to me, but not so lovely. What a charming song! It’s hard to think Ronsard would have played around with so charming a piece, but in fact Blanchemain’s version is different almost throughout. Here’s his text, marked up as usual. Qui est esclave d’un corsaire. Le veut de grace avoir de moy. Me priant que je le luy donne. Who is a pirate’s slave. And begs me to give her it. neque hoc neque illud imputat. tot barbare affectum modis ? eadem extulit pios senes ! And does not reckon up this or that to my account. After being barbarously wronged in so many ways? And whom the same love buries when they are pious old folk! Some commentary may help: I’m not sure that Scythian mice are known to be specially soft; but the part of Italy round Paestum (Campania, the region of Naples) is traditionally a fertile region. The coast of Liguria (running from Nice round past Genoa and towards Lucca) generally faces south/south west, so a SW wind will blow straight into many of the harbours and bays there. The Syrian and Sarmatian are ‘matched’ or ‘linked’ because of Ovid: the Roman poet lived in exile on the Black Sea & in his poems (the ‘Tristia’ and ‘Ex Ponto’) referred to the barbarians he was surrounded by as both Syrians and Sarmatians.